Looking to buy/borrow/rent a ring gear stopper that takes the place of the starter drive. Crankshaft pulley bolt REFUSES to come out. Need to lock the flywheel out to get it off. Will return tool, will pay for overnight shipping. Re: WTB Ring gear stopper ME LOVE U LONG TIME! For whatever reason, the bolt was on so tight that with a long breaker bar and the car in gear, the clutch would slip before turning the bolt. Grabs great for 8000 rpm launches, so I'm not quite sure. Anyhow, the thread is like a year and a half old. 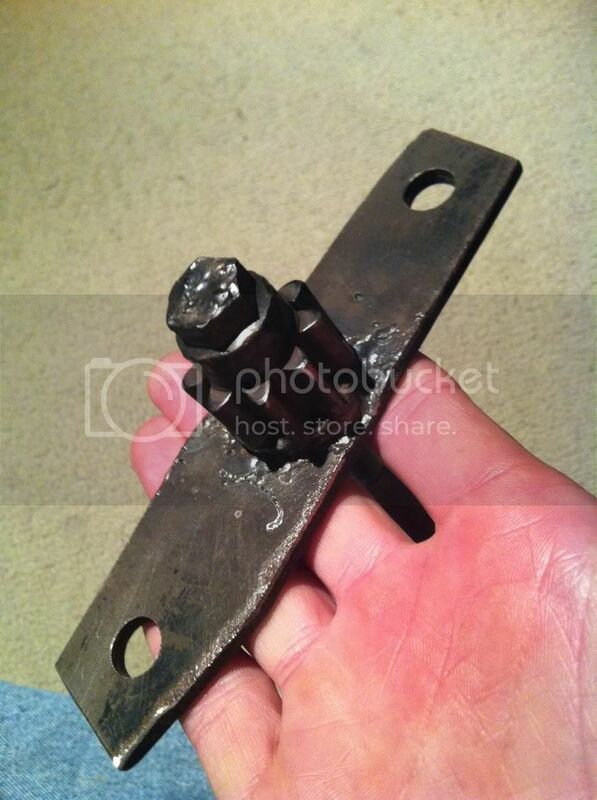 Ended up making my own ring gear stopper out of an old starter drive and a piece of steel lol. Works excellent. Here's the stopper I made. 3 equally spaced holes, the outer two are to fit in the bell housing for the starter, and the third right in line, and centered between the two. Not sure what the starter drive is off of, but the pitch of the teeth matches up pretty good with the RB flywheel. Originally had it bolted together, but it didn't work because no matter how hard I torqued it, the gear would spin. TIG welded it together and it worked mint. I was actually quite surprised how easy it was to make this thing. First attempt with the nuts torqued down and it fit perfect. Just had to weld it together. Last edited by christ.deyoung; 11-26-2012 at 08:33 AM. Reason: Incorrect URL for image.